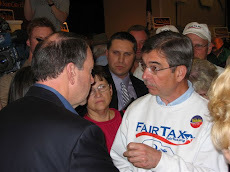 Thanks to a long time contributor to RTE for sending this comment & question that addresses my concerns made in several postings regarding the disbandment of the Tea Party: "Hi Doug - Now we discover the BO Administration has been targeting the Tea Party members filing for tax exempt status. Many organizers were scared off from the onslaught of questions by the IRS. On average it took Tea Party officials 27 months to open a 501 C. Perhaps this answers your question, 'What happened to the Tea Party movement?'" BO's problems with IRS abuses of power, the Benghazi murders & cover up, & the Justice Department's surveillance & seizure of AP reporters telephone records continue to mount. Thursday's press conference was billed by conservatives as the most important of BO's term in that he would be drilled by the White House press corps on these matters like never before. 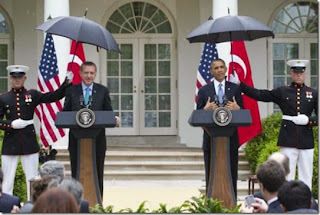 Instead BO made it a joint press conference with Turkey's Prime Minister Recep Erdogan who provided political cover in the rainy Rose Garden – see above photo. BO took few questions & provided no answers worth repeating. Acting IRS Commissioner Steven Miller was reportedly fired by BO earlier in the week as the first action addressing the IRS abuses of power. In fact it gets worse. Miller was not fired - he resigned, BO accepted his resignation, Miller was going to retire in two weeks anyway, & he was paid for giving his testimony today before the House Ways & Means committee. Click here to hear PA Congressman Mike Kelly receive a standing ovation for his line of questioning @ the hearing. But the most encouraging part of these problems is that there is a chance they will stick with enough of the citizenry to make a difference. This is especially true if the press does its job for the first time in a long time. BO famously said that his administration would be the most transparent ever. Now transparent means – "so open as not to conceal what lies beyond; readily understood, clear; easily detected; perfectly evident; free from pretense." Click here to hear Christian Adams explain to Lou Dobbs that none of the current problems should be classified as mismanagement but rather display a muscular ideology. Adams presentation shows that he sees what BO is doing which is nothing new to readers of RTE. In truth all of us know that BO's administration really has been the most transparent ever – in that we have seen right through his intentions ever since the first day he became a national figure. Doug - Hats off to Rep. Mike Kelly. These Congressmen must have been in transit for the last five years. The outrage they express at the Administration’s abuse of power signals they have been out of town since BO came to town. What is transparent to anyone paying close attention to BO and knowledgeable of history and especially Leftist ideology ? Answer is that BO is revolutionary with end goal of fundamental y transforming the US economic, social, and political framework with much stronger Government command and control. What are some of BO’s tactics? Go to Saul Alinsky’s Rules for Radicals and learn that one fundamental rule is to choose a target to demonize to accomplish end goals. Among BO’s numerous individual freedom loving, pro free Capitalist targets has been the Tea Party. I thus find it hard to believe that BO did not have a significant role in the IRS scandal. The first explanation that it was limited to low level rank and file employees is more than laughable. Rather that is an insult to our intelligence. Wait – there are more. How about Benghazi? Two weeks after the massacre, BO referenced a phantom video as a factor to the UN. It appears extremely likely that BO ordered this excuse to leave his mantra of “Bin Laden is dead and Al Qaeda is on the run” alive so he would win a close election. And when that strategy had some unintended negative repercussions, I personally believe BO and Candy Crowly rehearsed and then collaborated before the 2nd debate to trap Romney. Why else would BO have stated that he noted a day after the massacre (by an unreasonable stretch of imagination) that he said in a speech that it was an act of terror? BO asked Candi to reference the transcript. That transcript was on top of her pile on her desk. Why did not the media (not even Fox News) pounce on this? I tweeted to Candy my personal view. May her conscience deal with it. That was the turning point of the election Romney should have won hands down. And speaking of targets to demonize, how about Romney? The BO campaign reached a stupendous new low in accusing Romney for the death of a wife of one man who used to work for one of Bain Capital’s companies – with Romney gone the man lost his health insurance but his wife had her own insurance but then died of cancer. And Romney hardly fought back. That was incredible. 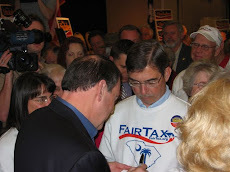 The Fair Tax will eliminate the IRS and the $430 billion tax compliance cost. Use that to pay down our debt and fund Social Security. Given today’s technology there is no need for the IRS. Given the temptation for the IRS to infringe on our freedoms is yet another reason to eliminate the IRS. Recall Nixon used the IRS against his enemies. History repeats itself; hence let’s take a pre-emptive strike against this and implement the Fair Tax. Another benefit of the Fair Tax is that is retains a progressive tax system. All will receive prebates up to the poverty level to offset the consumption tax impact. Please contact our Congressmen and Senators to enact the Fair Tax which will benefit all Americans, accelerate our economy, and maintain our freedoms.